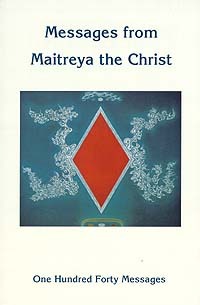 On July 19, 1977, the Christ, Maitreya, the World Teacher, Head of our Spiritual Hierarchy, emerged from his ancient retreat and is now in the modern world. With his Disciples, the Masters of Wisdom, he will inaugurate the new age of Synthesis and Brotherhood. 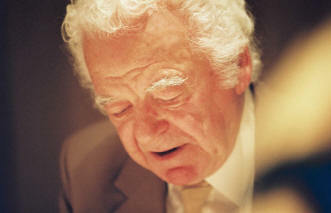 Benjamin Creme, British artist and esotericist, explains: "Early in September, 1977, I was taken before Maitreya Who asked if I would take, publicly, communications from him which, since 1974, I had received in the privacy of the group with which I work. On September 6, 1977, the first public Message was given at Friends House, Euston Road, London. "The Messages are relayed by me to the audience. No trance or mediumship is involved, and the voice is mine, strengthened in power and altered in pitch by the overshadowing energy of Maitreya. They are transmitted simultaneously on all the astral and mental planes, while I supply the basic etheric-physical vibration for this to take place. From these subtle levels, the Messages impress the minds and hearts of countless people who are gradually made aware of the thoughts and the Presence of the Christ. He releases in this way fragments of his Teaching, to prepare the climate of hope and expectancy which will ensure his being accepted and followed, quickly and gladly." Through these communications, Maitreya, the Christ, suggests the lines that social change must take. He gives hints on how to recognise him and urges his listeners to make known the fact of his Presence. He evokes also the desire to share and to serve humanity and himself. * There are many reasons why I should descend and appear once more among you. Chiefly they are as follows: Many there are throughout the world who call Me, beg for My Return. I answer their pleas. Many more are hungry and perish needlessly, for want of the food which lies rotting in the storehouses of the world. Many need My help in other ways: as Teacher, Protector; as Friend and Guide. It is as all of these I come. * I come, too, to show you the way to God, back to your Source; to show you that the Way to God is a simple path which all men can tread; to lead you upwards, into the light of that New Truth which is the Revelation that I bring. * Allow Me to show you the way ― forward, into a simpler life where no man lacks; where no two days are alike; where the joy of Brotherhood manifests through all men. * Mine is the task to lead and guide, but you, willingly, must follow. Otherwise, I can do nothing. My hands are tied by Law. The decision rests with mankind. * When I make Myself known, I shall express the hope of all mankind for a new life, a new start, a readiness to change direction; to see the construction of a New World in which men can live in peace; can live free from fear of themselves or their brothers; free to create from the joy in their hearts; free to be themselves, in simple honesty. * My task is but beginning, but even now there exists in men's hearts a new light, a new hope, a sense of a new beginning; a realisation that man is not alone, that the Protector of All has sent His Agent. * Throughout the world there are men, women and little children who have not even the essentials to stay alive; they crowd the cities of many of the poorest countries in the world. This crime fills Me with shame. My brothers, how can you watch these people die before your eyes and call yourselves men? My plan is to save these, My little ones, from certain starvation and needless death. * My plan is to show you that the way out of your problems is to listen again to the true voice of God within your hearts, to share the produce of this most bountiful of worlds among your brothers and sisters everywhere. * Man is made to serve both God and man, and only through that correct service can the path to God be trodden. * Each man is a lighthouse and sheds abroad his light for his brother. Make bright your lamp and let it shine forth and show the way. All are needed, every one. No one is too small or young to take part in this Great Plan for the rescue and the rehabilitation of our world. * Resolve to do this and be assured that My help will not be withheld. * How to start? Begin by dedicating yourself and all that you are and have been to the service of the world, to the service of your brothers and sisters everywhere. Make sure that not one day passes without some act of true service and be assured that My help will be yours. * My face is known to a growing number of your brothers, but My name for the present must remain undisclosed. In this way, My secret can be maintained. Why should this be so? * To enable you, My friends and brothers, to find Me from the light within you, that Light which I bring. You must know and want That for which I stand. Within your hearts must burn the desire for Justice and Truth. Where these divine aspects are present, you will recognise Me. * The problems of mankind are real but solvable. The solution lies within your grasp. Take your brother's need as the measure for your action and solve the problems of the world. There is no other course. * Many there are who fear My Advent. The guilt of ages sits upon their shoulders and they trust not. My friends, through Me shall be created the Era of Trust, the removal of guilt, the Citadel of Love. * In awe do men await Me. My friends, I am not God. As your Brother, your Friend, your Teacher, do I come. Forget this not. * All who share the hope that mankind should live in peace together work for Me. Peace, Sharing and Justice are central to My Teaching. Wherever the Light of these Truths shines I turn My eye, and through the channel of that Light do I send My Love. Thus do I work. Thus through you do I change the world. * Sharing and Justice, Brotherhood and Freedom are not new concepts. From the dawn of time mankind has linked his aspiration to these beckoning stars. Now, My friends, shall we anchor them in the world.